By a magnificent piece of belaying, Peter Schoening � the youngest member of the party � succeeded in holding all five men. Houston lapsed into unconsciousness, and might well have died had not Bates managed to rouse him. After securing Gilkey to ice axes on the steep slope, the five men found a bivouac site on relatively safe ground and, less than an hour later, went back to bring in Gilkey. He had been swept away by an avalanche. The stricken party then had an appalling time descending the mountain to their base camp. At one stage � fearing that he would bring down his companions if he fell � the weakened Houston considered jumping off the mountain to his death. "I knelt in the snow and said the Lord's Prayer," he later wrote. "Next thing I can remember is being grasped by strong arms and helped into Camp IV." 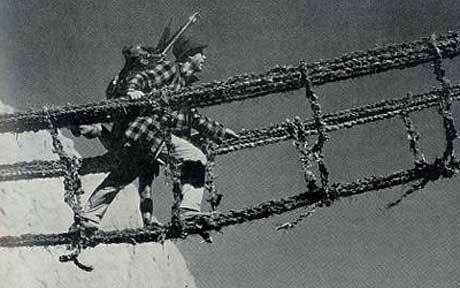 Houston gave up climbing after the tragedy, cancelling his plans for a further expedition to K2 in 1955. As it happened, the summit was finally reached in 1954 by an Italian expedition under the leadership of Ardito Desio and Achille Compagnoni � though it required the assistance of bottled oxygen and 500 porters to do so. In 1936 Houston and the British mountaineer T Graham Brown organised perhaps the most successful of all pre-Second World War expeditions to the Himalayas in that it climbed the 25,645ft Nanda Devi. The expedition comprised four American and four British mountaineers. Two of the Britons � NE Odell and HW Tilman � were seasoned Himalayan climbers, and Tilman, who a few years before had taken part in a reconnaissance of the difficult approaches to the mountain, was chosen as leader.